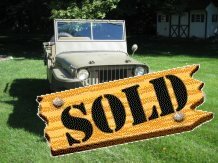 For Sale: Willys Slat Grille DOD 12-24-41 National Show Winner! 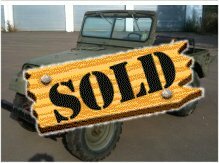 A rare opportunity to buy a true blue chip grade WWII Jeep! Slat Grill WWII jeeps are considered by many collector to be one of the most desirable & valuable of all war time jeeps. This particular jeep was delivered on Christmas Eve, which is quite cool by itself. Slat Grilles are known for their long list of early characteristics. These parts are quite rare and demand big money when sold. This jeep has all those items correctly done. The list includes: NOS A/C air cleaner, solid wheels with Good Year tires, gas & amp gauge, early thin needle speedo, early round exhaust, early type radiator, hinged filterette box, zippered bottom seat cushions, early type T-84, early Ross steering box, scalloped rear axle shafts, split back seat frames, two hinge tool box doors, early type hood, early type intake manifold, early type rivet oil pan, early type leaf springs (fronts are NOS), early pedal pads and arms, early type battery tray, Purolator oil filter, early generator, & small dip stick, Willard Optima battery, etc... A jeep this pure & accurate rarely comes to market. Only 200 plus miles since it was completed in the late 1990’s. Fully photo documented plus AJP has checked and freshened, upgraded or fixed any issues we have found. Included with jeep: top assembly, half doors, windshield cover, all original tool kit, spare parts and original manuals and a new Beachwood Canvas OD vinyl cover .